On the Keeping Families Together national bus tour, some 500 families shared stories about how America’s failed immigration policy has impacted them. On Wednesday, a bus from New York City to Washington, D.C., traveled one of the final legs of the national Keeping Families Together bus tour, a grassroots campaign calling for comprehensive immigration reform and a path to citizenship for America’s estimated 11 million undocumented immigrants. In just under three weeks, buses clocked in tens of thousands of miles, passing through more than 90 cities in 19 states, covering 100 congressional districts and reaching 38 U.S. Senate offices. At stops that included fervent rallies and faithful vigils, an estimated 500 families participated by sharing stories about how America’s failed immigration policy has impacted them. Some of the buses carried immigrants who openly revealed their undocumented status for the first time on the tour. Others included families of mixed status, including an American-born veteran who said that, even after serving his country in the military, his undocumented wife remains at risk of deportation. Many children rode the buses to speak publicly on behalf of their families; other riders advocated for children left in foster homes when their parents were deported. The journeys evoke the Freedom Rides of the early 1960s, when civil rights activists rode interstate buses into the Deep South to challenge the segregation of interstate bus and rail stations that persisted after the practice was declared unconstitutional. One elderly Freedom Rider even greeted riders in Washington, D.C. The tour was organized by the Fair Immigration Reform Movement, a nationwide coalition of organizations that span religious communities, labor and immigrant rights groups. Organizers planned the tour to lead up to March 21, the deadline by which the coalition is calling on the Senate to introduce a reform package that outlines a clear and unencumbered path to citizenship. The last time Congress attempted an overhaul of the U.S. immigration system, much of the advocacy around reform took shape as policy debates behind closed doors. In contrast, the Keeping Families Together bus tour explicitly propels everyday families to the forefront so they can speak for themselves, even in the face of deportation. Riders have met with federal lawmakers across the country, telling stories and delivering letters and petitions calling for change. Namely, they are urging the Senate to make family reunification the foundation for reform and to put an end to deportations. They are targeting the senators responsible for drafting a bill, known as the “Gang of Eight,” which includes John McCain and Charles Schumer. The Fair Immigration Reform Movement also calls for policy language that protects workers’ rights, provides “opportunities for safe future migration” and guarantees the inclusion of LGBT rights — which is not a peripheral issue, considering the estimated 250,000 undocumented LGBT immigrants living in the United States. In addition, the coalition rejects tying enforcement “triggers” to a path to citizenship. It is expected that the Gang of Eight will unveil legislation by the end of this month, although De La Cruz had no further legislative updates. Much like the Freedom Riders, the Keeping Families Together tour carried intergenerational and multi-ethnic groups, but in stark contrast to the 1960s rides, this tour was largely met with positive response. De La Cruz notes the massive crowds of support that welcomed riders to small towns in states like Idaho and Oregon. 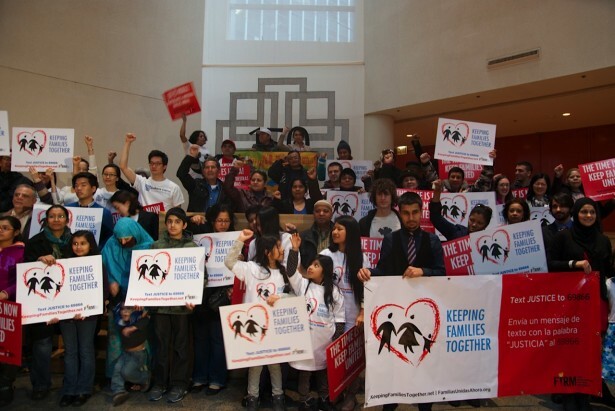 The Fair Immigration Reform Movement’s website showcases supporters from the Great Lakes region marching during a snowstorm in Cincinnati and citizenship workshops held at each stop of the New England tour. Grammy-winning artist Ricardo Arjona played in Phoenix to kick off the Arizona tour, while in California civil rights leader Dolores Huerta and astronaut Jose Hernandez took part. De La Cruz added that a final tour scheduled to travel through Colorado on March 22 will culminate in a movement-building training where immigrant families and supporters will learn to how to most effectively fight for immigration reform in their communities. Those who could not join the tour may participate by posting photos, videos and narratives on the coalition’s website. De La Cruz notes that the issue of immigration in this country is often viewed in terms of people from Latin America — especially Mexico. But she explains that this campaign brings to light a wealth of stories that emphasize the wide range of geographic regions and struggles represented in the fight for reform. In this sense, the voices elevated during the bus tour exemplify both unification and diversity, as the New York to D.C. tour illustrated earlier this week. Riders who gathered for a public send-off at St. Peter’s Church on the Upper East Side included U.S.-born citizen and junior high student Nushin Tarannum, who spoke on behalf of her father. He had pleaded for political asylum upon arriving to the United States from Bangladesh and later spent over a year in detention. Santiago Ortiz, a Puerto Rican-American who is HIV positive, spoke about his loyal partner of 20 years, Venezuelan citizen Pablo Garcia. Although the couple was legally married in Connecticut, the federal government does not recognize their union and denied Garcia’s application for a green card. As riders boarded the bus in New York, they carried the signs heralding slogans like “The Time is Now!” in English and Spanish. Joined by their loved ones, seven immigrants and one American-born citizen spoke about the fear and anguish rooted in detainment, deportation orders and relationships ripped apart. As the bus tour seeks to highlight, each of those stories is just one among millions. Such a joy to read, keep up the great work! God will grant justice and victory for families and all immigrants. This is the tour we took in Colorado. What a blast! A person essentially help to make seriously articles I’d state. This is the very first time I frequented your web page and so far? I amazed with the analysis you made to create this actual submit extraordinary. Magnificent job! These guys do a great job. It is nice to know we are expanding our voices beyond our own country, ambassadors for peace and equality. I am going to keep watching this site because it is exciting to see so many hard working people labor to restore justice to the name of the United States.